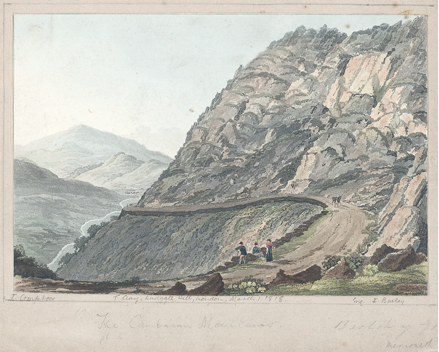 ‘Bwlch-y-Groes’ from Thomas Compton’s “The Northern Cambrian Mountains” (1818). Image from the National Library of Wales Landscape Collection /Casgliad Tirlun, by kind permission [link]. It is the most tantalising of seasons. The first frost of the year is guaranteed to be a matter of weeks away. On a day in mid-October the weather might be anything from bright to drenching. This Thursday I have luck. In Llanymawddy early afternoon outside the church of St Tydecho the sky looks promising, enough cloud to protect against an excess of sun but of a shape and texture that suggest no rain. The oaks and limes on the valley floor are still thick with leaves. It is a day that has worked out nicely. The morning has started in the Raven Inn in Llanarmon-yn-Ial, a village pub owned and run by the community with all the flavour which that status brings. The memory of a scintillating night at Mold’s Theatr Clwyd has been fresh in the mind and eight paragraphs for Theatre Wales, the critics’ hub founded by Aberystwyth’s Keith Morris, have flowed with ease. With the main task for the day done, the route to the coast, broken by a stroll around the architectural treasure store that is Ruthin, has brought me to the upper Dyfi all by the time of the one o’clock news. I have been here before but not in a satisfactory way. The road from south of Bala to its highest point at Bwlch-y-Groes is narrow in ascent and precipitate in descent. The setting may be one of grandeur but in truth to be in command of a ton of metal means that the predominant emotion is anxiety. A vehicle may be coming from the opposite direction with all the manoeuvring on a tight mountain lane that such a meeting entails. Besides human perception is designed to work at its peak when passing through an environment at a speed of four miles an hour. “Everyday, I walk myself into a state of well-being” said Kierkegaard “I have walked myself into my best thoughts”. The best of travel’s pleasures are always serendipitous. With no obligation for hours this is the day for Bwlch-y-Groes. With no map and a changeable climate it is also not a day for straying from a secure route. It makes small difference. The walk takes an hour and half. In that time a couple of four-wheel-drives go by. Otherwise it is me and the landscape. It was not always so. Human traffic has shifted to the low route via Dolgellau but this was once a main thoroughfare. Today the village may be a silent string of houses but in its past Llanymawddy was host to enough human traffic to support eight pubs. The first suggestion of the clouds has of course been deceptive. The ascent from the floor of the Dyfi Valley means that the upper tree-line is soon passed and with it places of refuge from rain. The walker’s eye is tuned to the movement of clouds. The speed of change is dramatic; just minutes can pass between a sky with oblique shards of bright sunlight to black-grey clouds. Happily the wind at two thousand feet is just as swift in sending the rain clouds on to Cadair Idris. It is not just the eye that is called upon to work harder. It is a rare place where all sound of human industry disappears. On a distant ridge a post is being worked on. On and off the thwack of mallet on post carries across the interval of two miles distance. But in its absence natural sound predominates. Lower down an on-off October breeze shakes the branches of the trees still thick with leaves. Higher up it is the sound of water, the many streams pouring down to become the Dyfi. The soundscape is not unlike that of earlier traveller-recorders. Thomas Pennant was here in 1781. Just before the pass of Bwlch-y-Groes the road splits. The southern lane drops sharply to Efyrnwy, the arm to the north on and over to Llanuwchllyn and Bala. A memorial cross has been placed here in memory that this most now lonely of roads was once the direct route of pilgrimage from the north to Saint David’s. The purposes of place change. In that great piece of British cinema “A Canterbury Tale” Michael Powell and Emeric Pressburger fused their servicemen of 1944 with pilgrims of five centuries earlier. As for the walker of today there is the intrinsic satisfaction that it has all been achieved by leg and lung power rather than with feet on accelerator, clutch and brake. I am not an out-and-out Kierkegaardian but on the power of the walk he is quite correct. There is not another two-legged creature to be seen but the bracken is filled with life. The nearby circling red kite knows it well and is looking for it. Happy it is to be of the species of infinite specialisation of work. The human eye no longer has to scan a landscape for sources of sustenance. It can look for the unseen. That most eminent son of Llanuwchllyn, O. M. Edwards, said of Bro Aran: “Mangre dawel fynyddig ydyw, lle ardderchog i enaid ddal cymundeb a Dduw.” “This is a silent, mountainous retreat, an excellent place for communion with God”. This entry was posted in Walkers' Blog on 10th November 2016 by Luca Guariento.